[An Exclusive Giveaway] of WonderFox DVD Video Converter. Discussion in 'Giveaways and Contests' started by sid_16, Dec 9, 2015. 1st. I would like to thank Kevincy from Wonderfox Soft, Inc. for sponsoring an unlimited license code of WonderFox DVD Video Converter to all our members and guests. Note: This giveaway version works the same as the Full Version being sold. This 6-month license means, MDL members can use it for lifetime once you activate the software before Jun 1, 2016. In addition, within the 6 months, you can enjoy free update and technical support for free. After Jun 1, 2016, you can still use it as long as you wish, but only when you purchase the Full Version can you enjoy lifetime free upgrade and take advantage of all new features and enhanced functions. Want to enjoy a complete movie night with your family instead of waiting a long time for conversion? WonderFox DVD Video Converter is the best choice, which provides one-stop total solution to Rip DVDs (Disney, Paramount, Sony Included), Convert videos, Download online videos, Edit and Play movies/video with excellent performance. It supports the newest NVIDIA CUDA, Intel Quick Sync, multi-core CPUs, batch mode and unique encode technology, which makes the conversion speed 30-50X Faster than ever. What’s more, it supports Variable Biterate (VBR) which offersbetter quality in a smaller file size. You can even use the video and DVD converter to easily download online video from YouTube, Facebook, Vimeo, Liveleak, Metacafe and other popular online video websites. Furthermore, a DVD video player is built-in, which you can use to play almost all kinds of audio and video files, even DVDs and HD videos. This professional program offers the Best Free Trial experience - Long-time unlimited conversion without putting any watermark on output files. WonderFox DVD Video Converter must be the best DVD converter, which is able to back up any encrypted DVDs including DVD with CSS, region code, RCE, Sony ArccOS, UOPs, Disney X-project DRM and the latest encrypted technology. DVDs released by Metro-Goldwyn-Mayer (MGM), Paramount Pictures, Sony Pictures Entertainment, Inc., Warner Bros Pictures, Universal Pictures, UNITED ARTISTS, 20th Century Fox and The Walt Disney Company are all supported. Furthermore, the DECSS technology is continuously updated to handle new commercial DVDs. Besides powerful DVD decrypted technology, this DVD converter can flawlessly rip out DVD content, with fast speed and 0-quality-loss. All your DVD backup requirements will be realized with this DVD converting software. From now on, enjoy your favorite DVD movies with this DVD Converter. Convert DVD to (HD) Video: Enable to convert DVD video to all hot video files or HD video files including HD AVI, HD MP4, HD MOV, FLV, HD WMV, AVI, MP4, VOB, MKV, WMV, MPEG, etc. 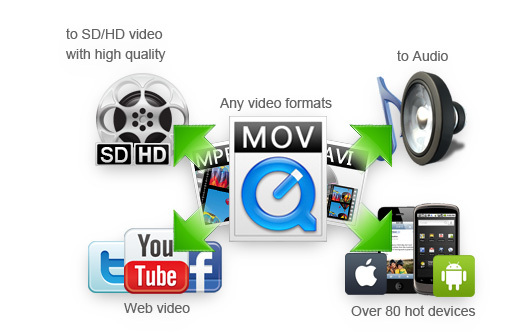 Convert All Popular (HD) Video files to 150+ video formats. Online Video Downloader – Download Video from YouTube, Facebook, Vimeo, Liveleak, Metacafe, etc. A build-in smart web video downloader is also provided. With only a few clicks, you can easily download online video files and then transfer to any of your portable devices. 1. Download online video from YouTube, Facebook, Vimeo, Liveleak, Metacafe and other popular online video sources. 2. 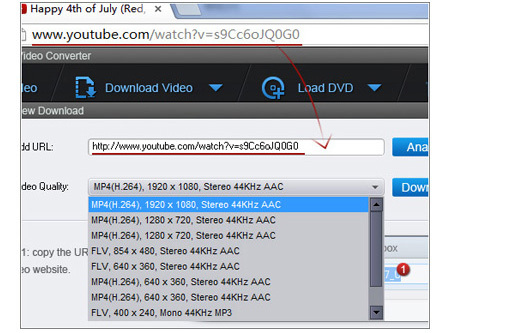 Enable to choose high-definition source video to download from YouTube. 3. Enable to download 5 online videos at one time. Video conversion speed should be one of the most important elements which could tell you how good the product is. WonderFox DVD Video Converter improved a lot on video conversion speed. A 120-minute video with 1280*720 resolutions can be converted out in 3-7 minutes with 0-Quality-Loss. The conversion speed is much faster than all current mainstream (even hot popular) video converters. 2. Allow to use multiple CPU cores and set CPU utilization. 3. GPU (NVIDIA® CUDATM and AMD®) acceleration is available. 4. Unique encode technology which offers 30X-50X faster conversion speed than ever before. P.S. MDL members can contact us with the username at support@videoconverterfactory.com if they have any problem or suggestion. What about this contest, isn't open !? Everybody can get a license freely from the giveaway link. Guys, you sure have noticed the thanks button? Thanks for this post and thanks to videoconverterfactory.com also.